THE VERDICT: An episode that takes us out of Starling City and injects a little touch of spy-chic: Isabel gets to wear the kind of fur hat that glamorous guest stars rocked in Cold War episodes of Mission: Impossible and Oliver has a chance to Bond it up, flaunting his knowledge of Russian in a restaurant and participating in an opportunistic shag. There’s even a lovely espionage-soaked piece of incidental music as the team prepare to board their jet. Yes, we know the Russian location is conjured with greenscreen – spot that glimpse of Red Square placed in a corner of Vancouver – but it feels refreshingly exotic and the icy gulag makes for a grimly atmospheric crucible for this tale, with a great, brawly action sequence at the climax. The plotting could be a little tighter – Deadshot and Dig have an uneasy truce but it feels like we’re missing opportunities to see the storytelling screws tighten even further. There should have been more mindgames, some harder moral choices to be made. Isabel, too, should have been more of a complication for the team on this trip, rather than conveniently going on a tour while the rest are organising the rescue mission. Truth told, she’s been a bit of a drag on the show so far. 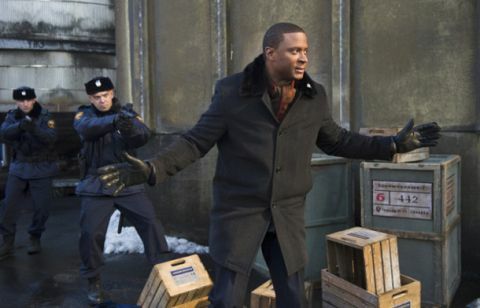 It’s a Dig-centric episode – always a good thing – and while Arrow himself takes a back-seat there’s a fan-friendly tingle in seeing Oliver and Roy in action together, green hoodie side by side with red hoodie, edging ever closer to the iconic Green Arrow/Speedy duo. TRIVIA : Amanda Waller, head of Task Force X, is a mainstay of the DC Universe, first appearing in Legends 1 in 1986. She’s been brought to the screen before: Angela Bassett played her in Green Lantern while Pam Grier took on the role in season 9 of Smallville . HMM: Another mention of a certain particle accelerator in Starling City, now with added warnings of doom. What can possibly go wrong? LINGUISTIC NITPICK: We’re told that there’s no word for optimist in Russian. But there is, and it’s оптимист. Any other hoary Cold War cliches need disabusing?